If you type in Piros Tramini into a search engine, you will most likely see links to information about Gewürztramine. While it is true that the grape’s origins are the same, like all things Hungarian the wine grown in Hungary has its own distinctive character that makes it somewhat different than the Gewürztramine you may have tried from other regions. 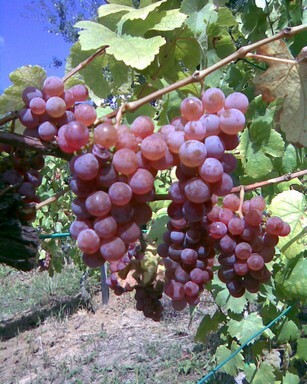 Hungarian Piros (red) Tramini, or just Tramini, creates a very aromatic and floral, sometimes spicy, white wine. Roses are often associated with the wine produced from Hungarian Tramini. It has a high sugar content and ripens early, making this the earliest harvesting grape we grow (either in late August or early September depending on the weather that year). It also requires more green work than other variety we grow except our Riesling. As elsewhere, Tramini grown in Hungary is best planted in cooler regions if one is to make the best of its wine making potential.